I went to Woolfest last weekend with three of my friends from Sheffield. I went up to Sheffield by coach on Friday. If you follow me on Twitter, then you already know that the air conditioning wasn’t working and it was just awful where I was sitting. But there was a plug socket and free WiFi so it wasn’t too bad. I spent Friday night at Lucy’s and we went out to eat with Sarah and Janice for my second ever curry. I’ve decided that I like Indian food, as long as it’s very mild on the spice. If I remember correctly, I had a lamb paneer? Whatever it was, I liked it. The portion was huuuuuge, so next time I’d be better off just getting a side portion instead of a main, but that’s an issue I have with a lot of places. Saturday was Woolfest day! The drive there and back was fine. I really miss driving, even with the morons who hog the middle lane on the M1. Seriously, if you’re not passing other cars, just shift over to the left. I managed to be a bit more restrained in my spending this year, but I still feel like I came back with some really great stuff. 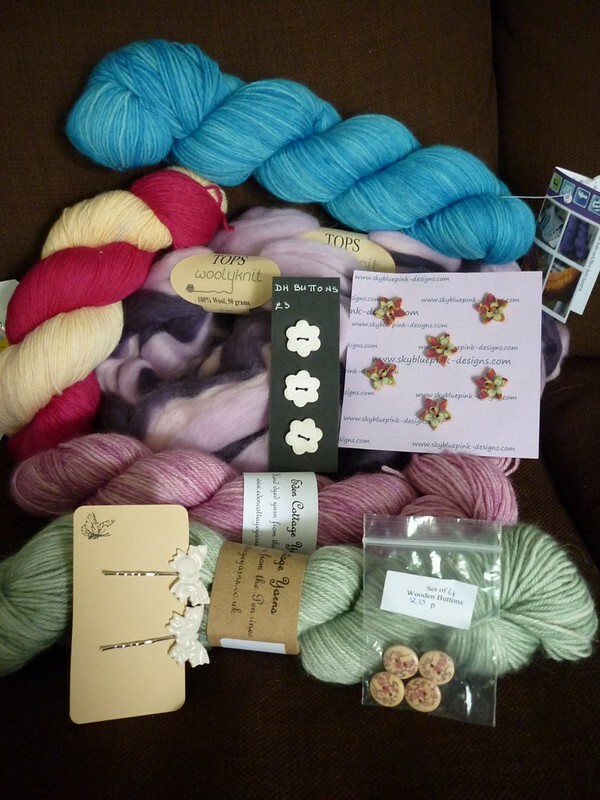 I got 100g of fibre from Woolyknits, a skein of Sparkleduck Spirit, two skeins of Eden Cottage Yarns Bowland DK, a skein of EasyKnits Cherish (I think), buttons from three different places and butterfly hair accessories. I also got a lot of photos of sheep and alpacas and goats while there, but I haven’t uploaded those from my camera yet. Came back from Sheffield by coach on Sunday. This time the air conditioning was working, but there were no power sockets and no Wifi. Fun times. And it looks like I missed the great weather down south while at Woolfest! It was only +15C and slightly rainy on Saturday up in Cumbria. Sunday it got to +27C and was super sunny down in London. Today? Partly cloudy and only about +20C. How do I always seem to miss the nice weather? We decided to go out to eat yesterday and settled on Byron Hamburgers at Westfield. I was really pleasantly surprised at how great the service was. All of the staff were super friendly and our waiter in particular was awesome. He took the time to chat with us and made me feel like he actually wanted to know what we had to say (unlike some places that just pretend to like chit-chat). I also noticed how attentive and fun he was with the kids sitting in the booth next to ours. So I’ve now e-mailed the company and let them know. I know how rare it is to hear good things, so I make a point of letting the manager, etc know if I’ve had great service at a restaurant or shop. Plus the food was great so I’m definitely going back there again at some point. Knitting-wise (since this is supposed to be a mainly knitting blog), I’ve now finished all of the WIPs I’ve had on the needles since forever. My Joanie sweater still needs buttons (I bought some from Iceland but I can’t find them! ), the Ethereal shawl is done as are the Glass Slipper socks. So today I’ve cast on TPHPE by Heather Zoppetti. I’ve got an urge to learn double knitting after I saw someone do it at the knit group at the Loop two weeks ago. So I figure this’ll be a good starter project.